Once again, This is Your Life was the single most successful series on British television during 1977. 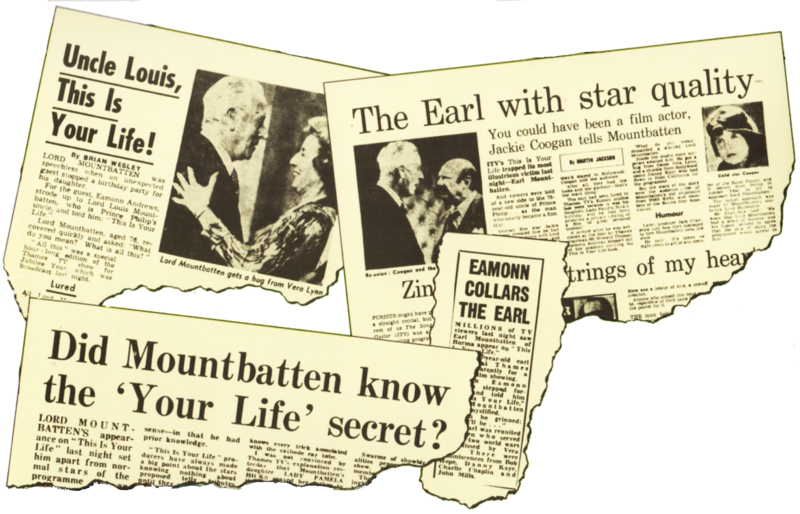 It also achieved its own all-time biggest audience on 27 April, when Lord Mountbatten was surprised by Eamonn Andrews in the Thames foyer, and with nearly 18½ million viewers watching, spent an hour reviewing his past in the company of his family, Juliet Mills, Sir John Mills, Vera Lynn, Sir Bernard Miles, Danny Kaye, Jackie Coogan, and (on film) Bob Hope and Douglas Fairbanks Jnr. By popular request the programme was repeated on Boxing Day. By then the current series was already under way; outstanding among the present run of Lives’ was the tribute to Virginia Wade, winner of her first Wimbledon title in Jubilee Year. Opportunity Knocks discovery Tom O’Connor established in 1976 through Wednesday at Eight and in the Royal Variety Performance, featured in his own series of six half-hours which began in March. Tom’s humour was complemented by musical entertainment from guests like Barbara Dickson Mahogany and the King’s Singers. 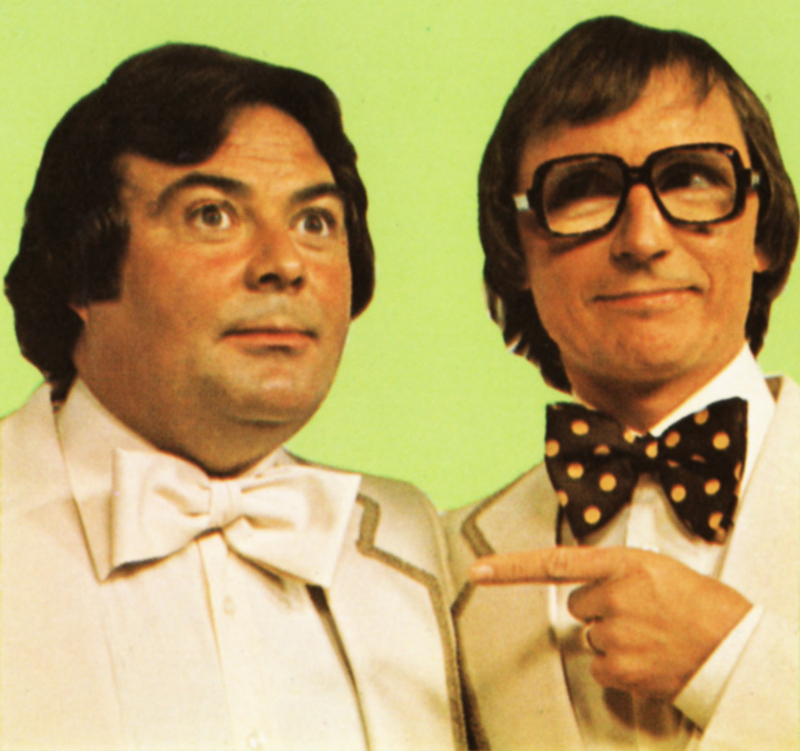 Two more Opportunity Knocks proteges, Syd Little and Eddie Large, topped the bill for their first major series in The Little and Large Tellyshow. 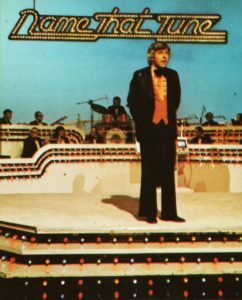 With guests from the younger generation of pop music – Suzi Quatro, The Jacksons, Linda Lewis, the Four Tops, and Rock Follies’ Rula Lenska among them – the show came into the Top Twenty at number 13, stayed there for three weeks and then jumped into the top five. And starting on the same Monday night in April, Man About the House’s Paula Wilcox went straight to number one in London, second on the Network, in the lead role of Richard Waring’s new comedy series Miss Jones and Son. It was an outstanding success from a controversial subject – that of an unmarried mother. ‘Richard Waring’s scripts look for laughs in the right places, and set the complicated life of the motherly Miss Jones in a houseful of sympathetic and lively characters,’ concluded the Evening News. Richard O’Sullivan, who starred alongside Paula Wilcox in Man About the House, hosted the 1977 TV Times Awards, transmitted on 14 April. 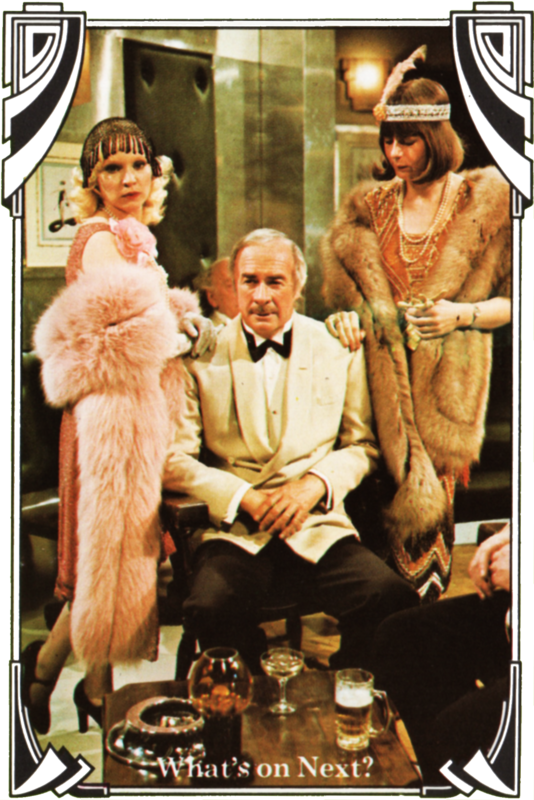 Among the Thames stars to whom he presented awards were John Thaw (Most Compulsive Male Character), Julie Covington (Top Female Singer), Yootha Joyce (Funniest Female Personality), and Penelope Keith and John Inman who were both at the time working on new Thames series (The Norman Conquests and Odd Man Out respectively). 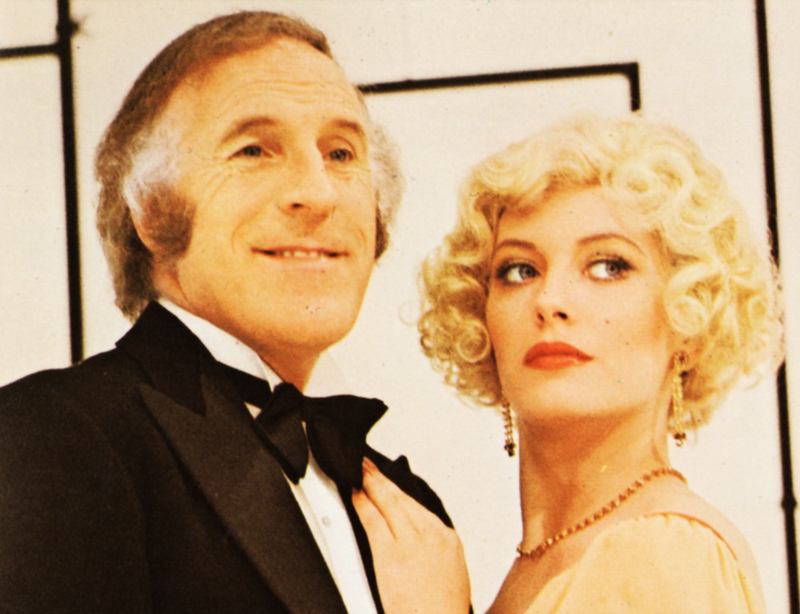 Top Male TV Personality was Bruce Forsyth, whose one-hour special Bruce and More Girls, with Lesley-Anne Down, Nanette Newman and Dana, topped the London and UK ratings in the same week. ‘Not only did Bruce Forsyth do well with last year’s light entertainment special – he seems to be doing even better as tonight’s show proves. It is literally bulging with talented singing, dancing and comic young women. If there’s one thing that Bruce Forsyth generates it’s pleasure’. Special Easter programming included The Story of Job, a new ballet choreographed to the music of Vaughan Williams by Robert Cohan, danced by the London Contemporary Dance Theatre and narrated by Andrew Cruikshank: and on Easter Monday, Outside Broadcasts went to the Big Top in Croydon for a special Chipperfield’s Circus, hosted by David Hamilton. ‘A rare delight,’ said the Sunday Times; ‘engrossing… it’s all beautiful fun’ added the Daily Mail about Terry Dixons’ two one-hour films on the life and work of Walt Disney. 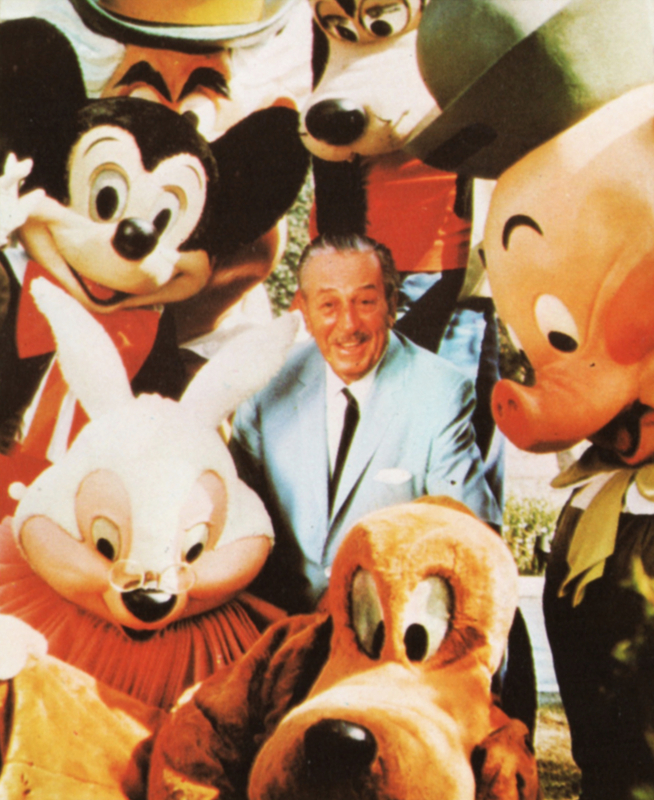 Having achieved rare access to the Disney empire, the story was told both through film clips (from the earliest sketches to Disney’s wartime propaganda cartoons) and in the words of the people who knew and worked with Disney – animators and directors, Walt’s daughter (who sang Snow White’s songs), and even the living voice of Donald Duck, Clarence Nash. 14 million people watched the films, placing them firmly in the Top Ten, itself a rare achievement for television documentaries. Former CIA Director William Colby and ex-Head of US Air Force Intelligence General Keegan were among those interviewed by Peter Williams in This Week’s five-programme series on international intelligence and espionage, which revealed a worldwide network of spying and intrigue, murder and blackmail, and a new, horrifying generation of nuclear ‘superweapons’. 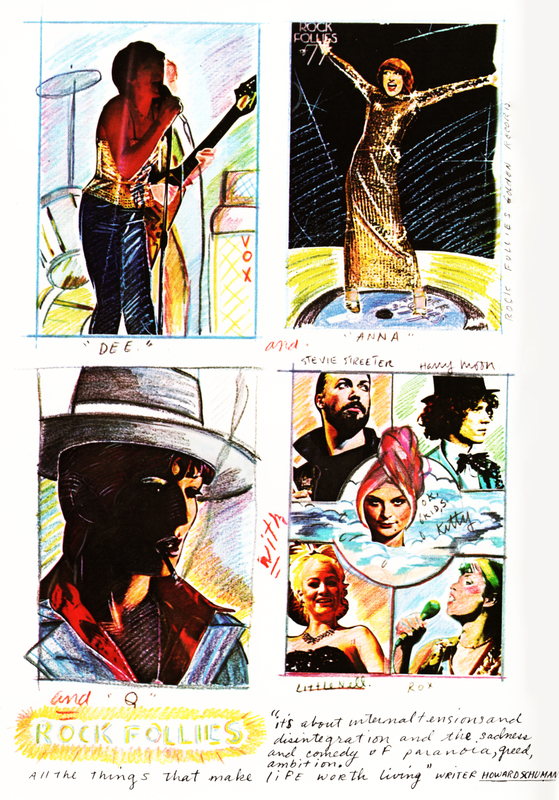 Rock Follies of ’77 began in May, was interrupted by dispute halfway through its run, and finally concluded towards the end of the year, by which time plans were already under way for a Follies feature film. In this second series the Little Ladies rock group, comprising Julie Covington, Rula Lenska, Charlotte Cornwell and new member Sue Jones-Davies, had found a new extrovert manager, zestfully played by Beth Porter. Over twenty new songs by Andy Mackay were included. Then seven half-hour reports investigated the workings of our state schools, posing the question Could Do Better? Reporter Jenny Conway visited primary and secondary schools, asking what school is for and whether it achieves its aims. In the final programme, Education Minister Shirley Williams and Shadow Spokesman Norman St John Stevas spoke about their educational ideals. 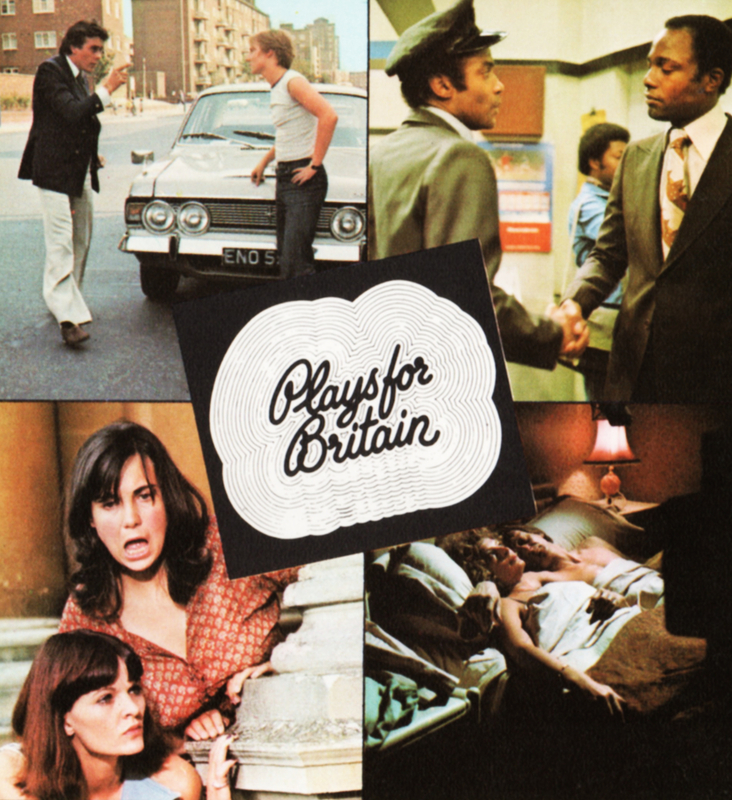 Barry Hanson, now producing ‘Out’ for Euston Films, was producer on six new Plays for Britain for the ITV Playhouse. This series, which has an unrivalled record for introducing new drama writers to television, used contemporary Britain as the overall backcloth for all its stories. They ranged widely, from the kidnapping of a pop star, to a witty evocation of a large company’s annual outing, to a vivid story of a car-stealing ring. Paradise Island originated as a short play by a design engineer called Michael Haley, inspired by a holiday in the Scilly Isles. He sent it to Thames, where it was developed into a whimsical situation comedy series with a cast of two – Bill Maynard and William Franklyn as, respectively, a priest and ships entertainments officer, who have been cast away on a desert island. As Paradise Island concluded its run, William Franklyn remained on Thames screens with a totally different kind of comedy series – What’s on Next?, a fast-moving mix of jokes and sketches in which he was joined by Pam Ayres, Barry Cryer, Bob Todd, Jim Davidson, Anna Dawson and Sandra Dickinson. This Monday night laugh-in gets funnier and funnier wrote the Daily Mail, and the audience agreed – it entered the London and Network Top Tens in third place, and by the second week had topped the London ratings. ‘Anyone too young to remember Laugh-In must have enjoyed the pace of What’s On Next?, wondering why previous comedy programmes hadn’t cashed in on sheer momentum. We have William Franklyn devilish smooth and caddishly quizzical, presiding over a team, encouraging smiles. It’s good to see Franklyn and his urbane, faintly disapproving style of light comedy. And it’s nice to get a show with so many comediennes. Outside Broadcasts covered the Derby and the Epsom Summer Meeting in June, and there were more horses in The King’s Troop, a colourful portrayal of the ceremonial horse artillery unit, which was transmitted on Jubilee Thursday. In May and June, This Week concentrated on the major overseas stories then dominating the headlines – three programmes on the Middle East, and two on the Ulster loyalist strike. Good Afternoon, attracting special attention for its harder news interviews and coverage, increased its audience through the year. April saw Mavis Nicholson interviewing Lady Mosley on her controversial biography of Sir Oswald and in May, she interviewed R D Laing. 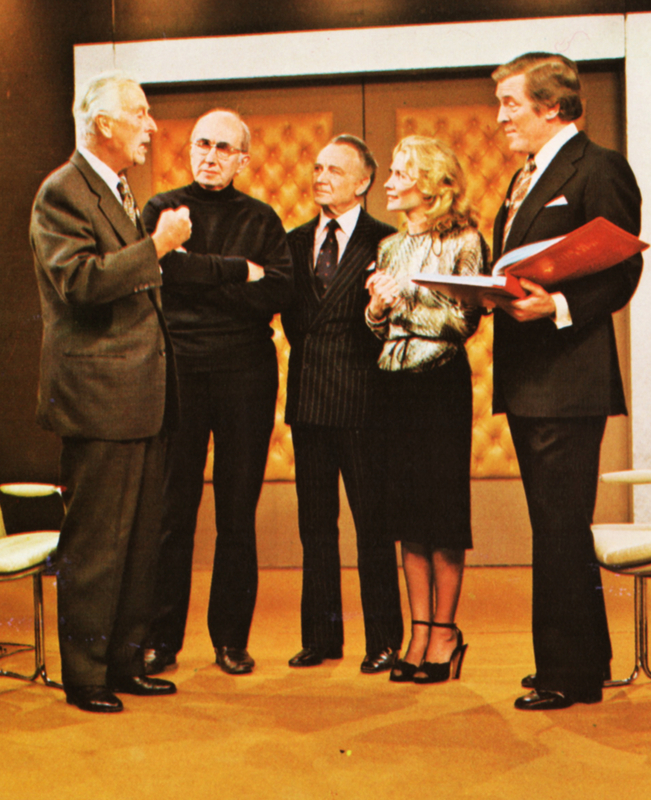 Judith Chalmers discussed natural childbirth with Frederic Leboyer, and all four presenters (with Elaine Grand and Mary Parkinson) met Stock Exchange Chairman Nicholas Goodison in the Thames studio. Film and OB reports covered education, nuclear power, and Morris dancing in the Cotswolds. Catherine Freeman, Producer, Good Afternoon. 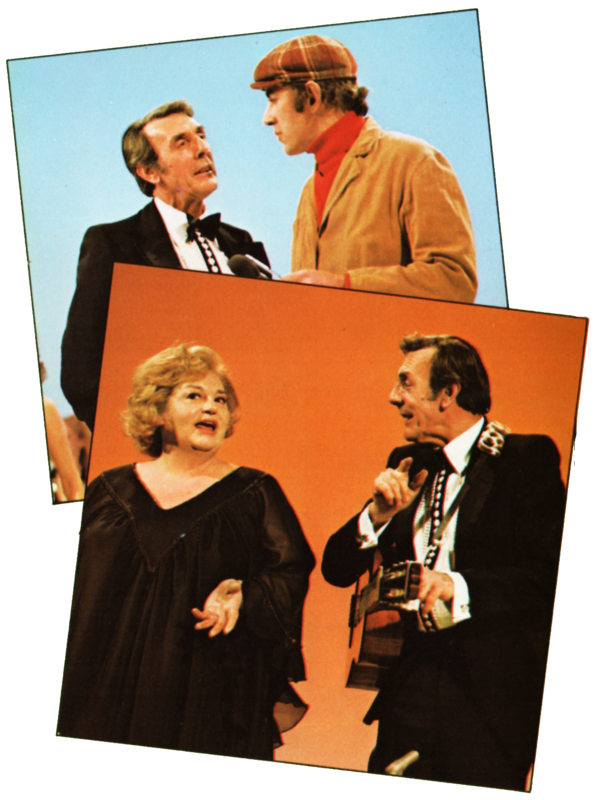 Eric Sykes showed his rarely-seen talents as singer, dancer and musician as well as comedian, in a self-scripted one-hour special which reunited him with many of his long-standing partners in entertainment – Hattie Jacques, Jimmy Edwards, Irene Handl and Peter Cook among them. Tags: 1977 TV Times Awards Bruce and More Girls Chipperfield’s Circus Cork and Bottle Could Do Better? Eric Sykes Good Afternoon It’s Only Rock ’n Roll Last Summer Miss Jones and Son Not Quite Cricket Odd Man Out Our School and Hard Times Paradise Island Plays for Britain Royal Variety Performance The King’s Troop The Little and Large Tellyshow The Norman Conquests The Proofing Session The Road Runner The Story of Job This is Your Life This Week Tom O’Connor Walt Disney Wednesday at Eight What’s on Next?